DJ's Book Corner: Save over $50 on EDGE, a #YA and #NA Paranormal Anthology! 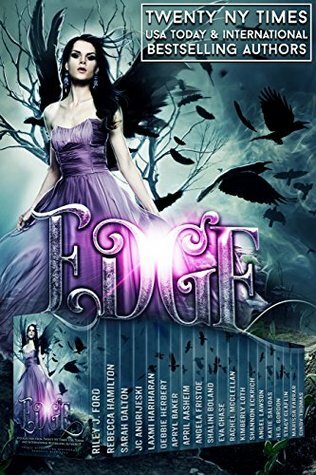 Save over $50 on EDGE, a #YA and #NA Paranormal Anthology! “I...” There were no words. I couldn’t put a single thought into words. All I could think about was the way his body was pressed up against mine and how amazing it felt to have his fingers caressing me this way. I never wanted it to end. “Don’t leave.” His lips were against my ear. I felt myself sway in his embrace, sinking further into him. “What?” I asked, confused. I wasn’t going anywhere. My entire body flushed with heat when his lips made contact with my neck. The door swung open behind us and Eli pushed us into his living room once more. There was a soft click when the door shut. I opened to my eyes to find his burning twice as bright as the flames he just ignited in my body. There was so much in his eyes at that moment: pain, anger, passion and something deeper I couldn’t quite place. Instead of fighting, I gave him what he wanted. I gave myself what I wanted. “I want you. I want this.” I placed my hand on his impossibly handsome face, enjoying the feel of his skin. He closed his eyes. And then his lips were on mine and my entire body burst into flames so intense I thought I might explode.